Compare prices on car hire in Mantova from all the major brands and find the best deals. When you book through us, unlimited mileage and insurance are always included in the price given. Mantova is the capital of Mantova Province and in 2009 a population of nearly 50 000 The province belongs to Region of Lombardy, which is to be found in the northern part of Italy , and the city is located in the middle of the country.It is approx. 150 km to the northwest, both Milan and Venice on the east coast. 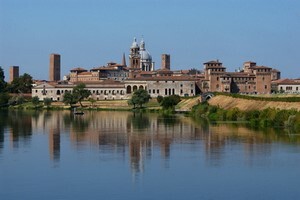 Mantova is situated by the River Mincio and there are several lakes that surround the city. Mantova is an ancient city that existed before the Romans conquered it around the year 220 BC Kr, and the old town retains much of its historic character. Early in the 1300s took over the Gonzaga family, power, and renewed much of the town’s architecture throughout the century and that they were supporters of the arts and culture. Gonzaga palace is considered to be one of the largest and most beautiful palaces in Europe. The Archaeological Museum is housed here and it is exhibited frescoes and paintings by, among other things, El Greco and Anthony van Dyck. Verona Airport is an international airport located approx. 25 km north of the city.